Questions? Fill in the form below and we will contact you. DRYDRY Original Dab-on – an extra effective and long-lasting remedy against excessive sweating. With a dab-on applicator suited for a blotting technique. DRYDRY Original Roll-on – an extra effective and long-lasting remedy against excessive sweating. With a big ball roll-on applicator. DRYDRY Sensitive – an effective solution against excessive sweating on sensitive skin. It is an alcohol free roll-on and can be used daily. DRYDRY Light – an effective remedy against excessive sweating which combines the power of DRYDRY Original and the delicacy of DRYDRY Sensitive. A roll-on that can be used daily. DRYDRY Light Wipes – an effective, long-lasting remedy against excessive sweating in convenient disposable packaging. May also be used on forehead and face. Perfect for traveling. DRYDRY Gel – an effective moisturizing, healing, anti-itch gel. Can be used alone or in combination with other DRYDRY™ products. DRYDRY Foot Spray – an effective solution against sweaty feet, with an added cooling and antibacterial effect. DRYDRY Shampoo – an effective hair and scalp treatment against dandruff (contains natural component Dermosoft® Decalact). Recommended for use in combination with DRYDRY Balsam. 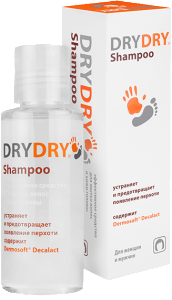 DRYDRY Balsam – a hair conditioner which moisturizes the hair and eliminates dandruff (contains natural component Dermosoft® Decalact). Designed to be used in combination with DRYDRY Shampoo. Lexima AB withholds the brand DRYDRY for products that are sold in the category of toiletries such as antiperspirants, moisturizing gels and creams, as well as shampoos and conditioners. Lexima AB is specialising in highly functional products, meaning very effective treatments and uses for special needs. The products are manufactured in Sweden according to very high standards.